The current debate concerning the origins of modern humans centers around a few questions: (1) How do we classify and date the human fossils of the Late Quaternary, and what are the implications of each classification? (2) Does a “multiregional evolution” model better explain the fossil and cultural records than the “Out-of-Africa” model? and (3) “Why,” “when,” and “where” did the transition from the Middle to the Upper Paleolithic occur? Each of these questions implies that we would like to know what is their meaning in terms of the evolution of human behavior. Currently these “big” questions end up, in the Western World, in their more mundane, simplified version when colleagues, journalists and learned people, who often implicitly hold a Eurocentric approach, demand to know, Who were the Neanderthals? How different were they from those who inhabited the Near East during the Last Glacial? 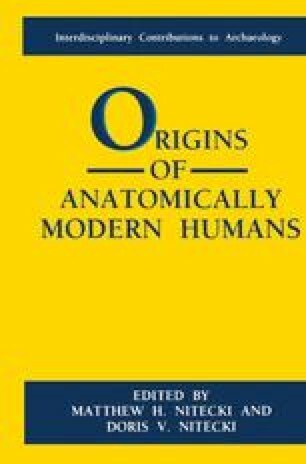 Is it possible that two human types defined on the basis of a few skeletal remains were contemporary and for how long? Are there any signs of the interbreeding of these two populations? Are the stone tools of the Near Eastern sites evidence the Out-of-Africa movement of humans? And so on. It is quite obvious that we do not have satisfactory answers and even worse a large number of scholars disagree on how to interpret the available fossil and archaeological records.